Posted on April 10, 2019. Roll-A-Cover has had a busy couple of months installing retractable roof systems, retractable glass roofs and retractable enclosures all around the country. As a result, these new Roll-A-Cover clients will be able to experience the outdoors year-round, even when their retractable roof system is closed due to inclement weather. Views of the sky will also create a perfect ambiance for their guests! Stay tuned while they decorate and open their new Roll-A-Cover spaces. The headquarters for the popular discount store now features a motorized skylight over the company’s rooftop dining area. These lucky employees can experience the outdoors while at work, and when the weather turns for the worst, they can simply close the retractable glass roof system and still have views of the sky while enjoying their break! 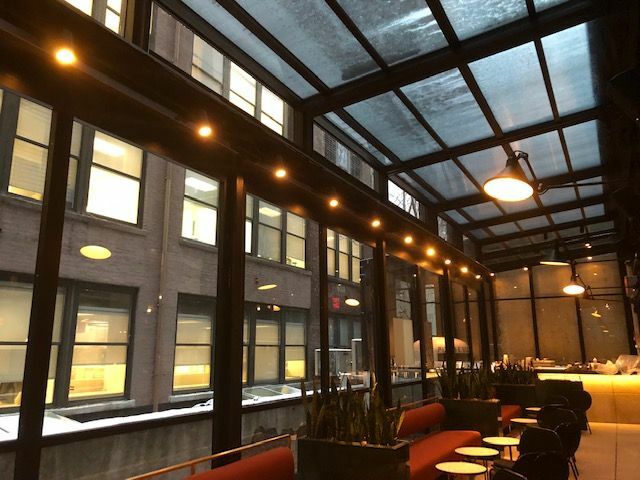 This gorgeous new hotel in Chelsea NYC features two Roll-A-Cover retractable roof systems. The retractable roof on the lower level is a motorized retractable skylight and a retractable roof system. With just the push of a button, diners can be protected from inclement weather and still experience an outdoor ambiance! The second floor is a Suncover enclosure where the roof panels retract upwards. As a result, diners can dine on this level year-round, as well. Located at the W Hotel in West Beverly Hills, this mega popular steakhouse now features a motorized skylight glass roof over its outdoor pavilion area. Patrons can now dine and drink outdoors even when the weather is inclement. If you are in LA, stop by STK! The Pod Hotel, which will be Philly’s first micro-hotel, will feature a beautiful rooftop bar with panoramic views of the city. 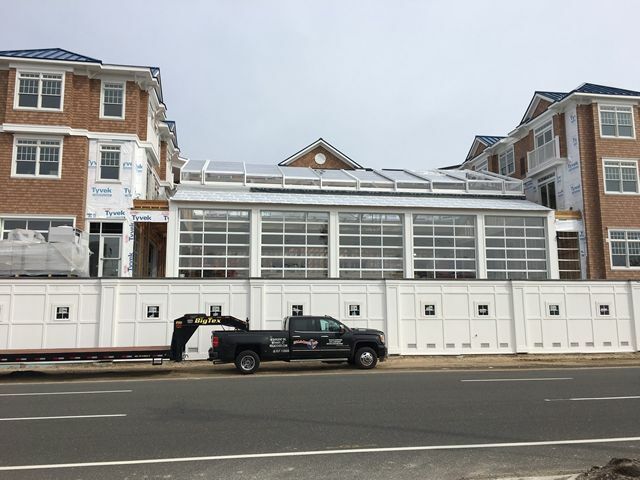 This ‘greenhouse styled’ rooftop bar will feature a motorized skylight/fully retractable glass roof system, which will certainly allow for year-round use of the rooftop! Perfect for locals and tourists alike. The Pod Philly will be opening in Fall 2019! Montesacro is an Italian restaurant coming soon to Brooklyn, NY. The outdoor patio will feature a retractable skylight. If you are in NYC, stay tuned for the opening date! This beautiful oceanside hotel in Ship Bottom, New Jersey, features an outdoor patio area that can be used year-round because of its motorized skylight. This retractable glass roof allows for its guests to enjoy views of the sky and the ocean even when the roof is closed. Roll-A-Cover, International is America’s largest manufacturer of trackless retractable enclosure products. When the weather becomes inclement you will quickly and easily be able to close your retractable enclosure and still be able to utilize your outdoor area. This allows your customers to be outdoors or indoors rather than having a permanent structure year-round. Roll-A-Cover has earned 14 North American awards for its retractable enclosure products and is continuing to cover restaurant patios, rooftops, and swimming pools across the globe. Don’t waste valuable outdoor dining space and lose money. Generate revenue year-round with a Roll-A-Cover retractable enclosure. For more information, please visit www.rollacover.com, call 866-393-7292, or email sales@rollacover.com. You can also follow us on social media @rollacover!